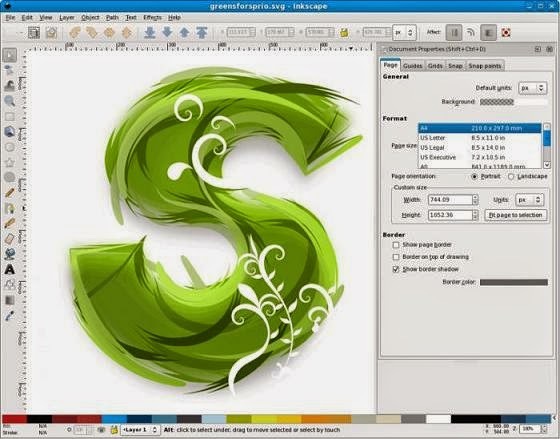 Inkscape is a graphic program intended for the designers, an Open Source vector graphics editor, with capabilities similar to CorelDraw or Adobe Illustrator, but with features, new tools, and interface style of its own. It can import and export various file formats, including SVG, AI, EPS, PDF, PS and PNG, so it is an easy complement to your other graphics and desktop tools. 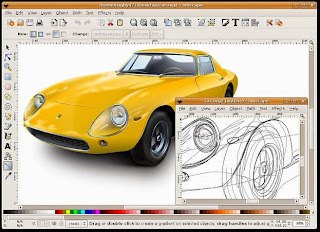 Inkscape has lots of features facilities for objects creation and manipulation, fill and stroke, rendering, text editing and operations on path. It is very easy to edit nodes, perform complex path operations, trace bitmaps and much more. With Inkscape, we can make a variety of 2D until 3D objects and other easiness are no less diference from Illustrator or CorelDraw. Inkscape is cross platform and has versions that run on Linux, Microsoft Windows, and OS X. -Filters, there is an easy to use slider for Gaussian blur for each object. -Bezier Curves tool allows the drawing of complex shapes. -Tools for arranging objects offer several new ways to position the elements of a drawing. -3D Boxes tool allows quick drawing and editing of boxes with perspective. -New Trace Pixel Art feature enables creation of vector art from bitmaps, icons, and sprites.